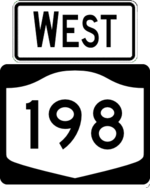 The NY 198 corridor was originally served by Scajaqueda Drive and Humboldt Parkway, which were two surface streets through Delaware Park. 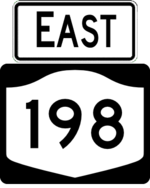 They were upgraded to a freeway known as the Scajaqueda Expressway (NY 198) in the 1960s, connecting NY 33 to I-190. Resident opposition to the expressway has always been high, and a fatal accident in 2015 resulted in a speed limit reduction from 50 to 30, a restriping of the road to narrow lanes and eliminate acceleration/deceleration lanes, and install guiderail. The accident also caused the movement to remove the freeway to rise into prominence and become very politically influential with both Buffalo and the state.